Community Links in Boston, Mass. is a collective with a mission to connect people with music. Matt Foley and Molly McElheny founded the group and have been using various avenues to bring about exposure to quality music and events with unique bookings. Foley was first exposed to house and techno while attending college in Buffalo, N.Y. 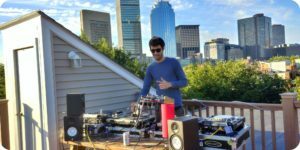 Whether he was hopping around local events or traveling to festivals, he began collecting music and started to dabble with mixing at home. Community Links was officially established in January 2015 with their first party held just a couple months later in March. At it’s core, and clearly represented by it’s name, the collective has been founded to be linked, and connect others, purely by their love and passion for music. Creative inspiration eventually led to a brand, an established weekly event (Techno Taco Tuesday), and regular events in DIY venues. He has worked hand-in-hand with his comrades to provide creative events for people, with bookings such as Miss I, iO (Mulen), Herodot, Mr. Roussos, VENDi, K.atou, and more. He and the crew will continue to grow the brand with consistent events in Boston, as well as abroad. They are working on collaboration with friends in other cities and countries, hoping to spread the feeling of interconnectedness beyond the Northeast. Additionally, they hope to release a record through Community Links “as yet another platform to showcase what inspires us. So that is something we will be working very hard on in the next year,” Foley says. It is clear through his sets and bookings that as an artist he has been deeply inspired by the minimal techno that has been emanating from Romania, from which he recently returned after attending Sunwaves music festival. In addition to Community Links, you can catch Matt Foley under his newest residency with Re:Set Wednesdays. Tune into his exclusive mix for the next Sequencer Soundcast installation. Matt Foley chose to not provide a track list for this soundcast.